Turck is presenting at the SPS IPC Drives fair the first fieldbus gateways and block I/O modules that communicate with Profinet IO, Modbus TCP or Ethernet/IP. The multiprotocol devices can be operated automatically in each of the three Ethernet systems. The new multiprotocol solutions help users of several different Ethernet protocols to effectively reduce the range of device variants required. Multiprotocol devices also enable the identical planning of machines and plant sections with different Ethernet protocols. Depending on the requirements of the end customer, only the controller or master have to be changed in order to offer machines for three different protocols. The comany from Mülheim/Ruhr, Germany offers multiprotocol devices for its modular BL20 series gateways for control cabinet mounting and also for the BL67 series for field mounting. IP67 block I/O modules including the space-saving BL compact series are also available as multiprotocol devices. 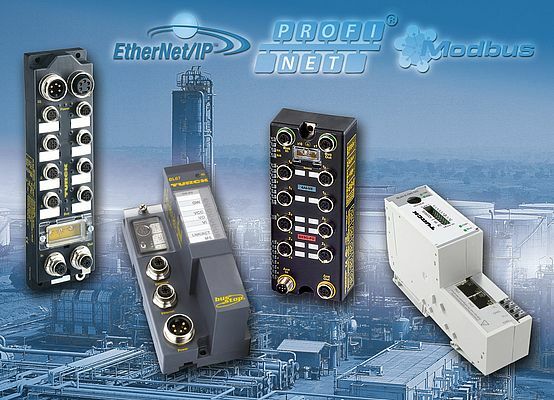 All devices can be installed in a linear topology using the internal switches and support "prioritized startup" functionality: QuickConnect for Ethernet IP and Fast Startup for Profinet. In QuickConnect mode a block I/O device starts up in under 90 milliseconds. In Fast Startup mode, the device takes less than 150 milliseconds to start up. In Profinet mode, the systems also support features such as topology detection and addressing via LLDP as well as the Media Redundancy Protocol for establishing a ring redundancy (Device Level Ring for Ethernet/IP). The devices detect the protocol used by listening to the communication traffic during the startup phase.